I have many interests, but a few of the most important are reading, writing, basketball, camping, traveling and even video games. I am pretty political, especially lately; and I try to be bipartisan, but my viewpoints tend to stray to the left. I also really enjoy watching movies, reading movie reviews and screenplays. I love to watch behind the scenes stuff and my biggest goal in life is to write a movie/ direct a film/documentary and using my communications and writing major to bring social change through film. Anyways, Good morning and good mourning; however you feel about it. It’s nice to meet you all and I hope we have some fun this semester. Was Vermeer a human camera? Last night I had the pleasure of seeing the movie Tim’s Vermeer, a documentary about a genius inventor obsessed with creating his own Vermeer painting. Johannes Vermeer was a Dutch painter born in 1632 who specialized in recreating scenes of domestic life in vivid detail. The painting below is a good example of his work. 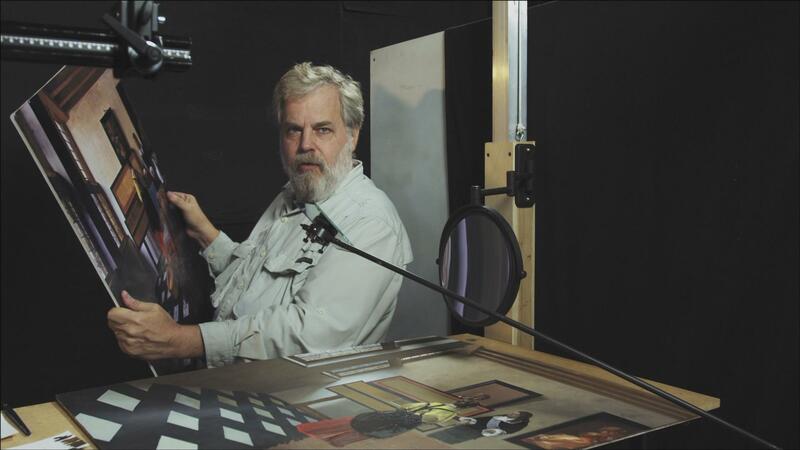 The subject of the film is Tim Jenison, a video graphics specialist who made a fortune as a 3D innovator. Jenison believes the photographic quality of Vermeer’s work would be impossible for a human to paint by sight alone. Instead, Jenison suggests the painter used a specialized “camera obscura” to create a mirror image of whatever he wanted to paint. Then he would blend color on the canvas until it matched the reflection. 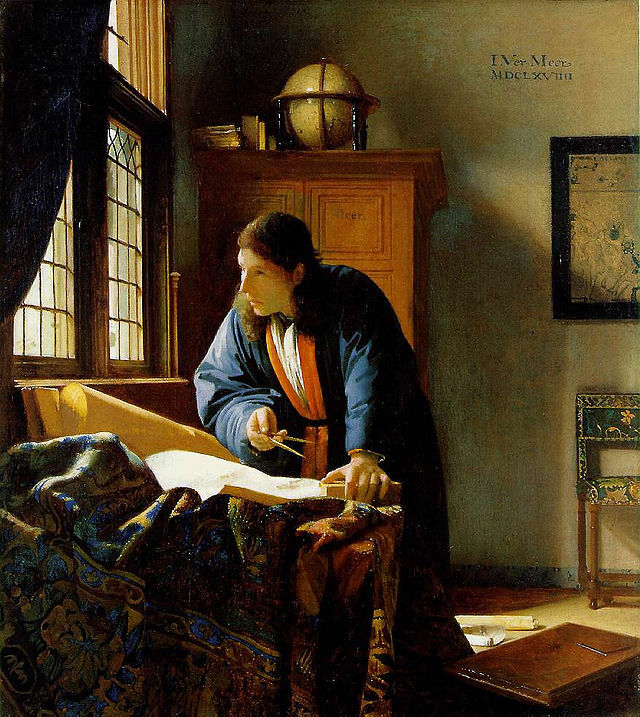 Jenison isn’t the first to suggest Vermeer used this type of technology to assist in his paintings, but he is the first person who ever set out to prove it. Since no real documentation exists other than the paintings themselves, Jenison decided to recreate a Vermeer painting using only the technology available at the time the painter was alive. The catch? Jenison had no prior painting experience. Through a painstaking process that took over two years, Jenison eventually completes a painting that looks nearly identical to the Vermeer he was imitating. 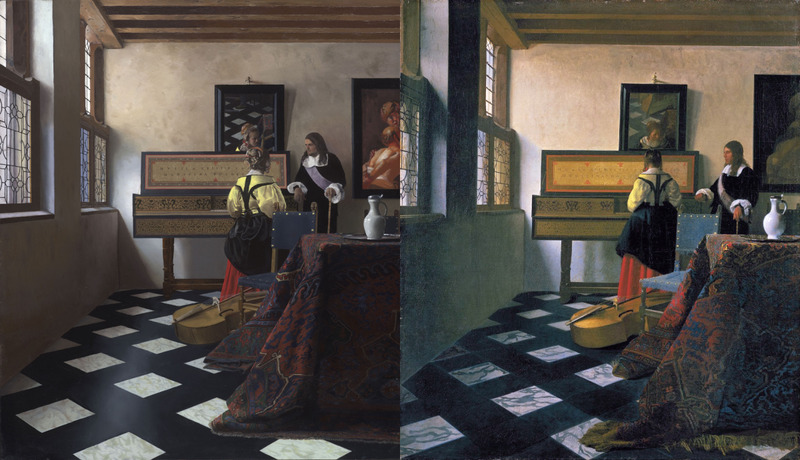 While this doesn’t prove that Vermeer used this method, it certainly shows that it is possible and maybe even likely. How else could the colors and detail in his paintings be so life-like? Rather than trying to defame or cheapen Vermeer’s work, this film does a great job of showing that art is not always what it seems. It clearly shows the blurred lines between art and invention, painter and tinkerer, and even genius and madness. The movie was directed by Teller (of Penn and Teller fame), and although it was a little dry even for a documentary, I’d still highly recommend seeing it. Can you tell the difference? Tim’s Vermeer, left, and actual Vermeer, right (The Music Lesson). The sets from both films are practically identical. So there’s no noticeable differences/effects there. This is a rather subjective topic, though both films do a good job of making the viewer much more involved than the stereotypical horror films we’re so used to. Now you could say seeing Rec prior to Quarantine may have made it seem less scary one might experience while watching Quarantine, but the same can be said for the reverse scenario. Though Quarantine has added a few new scares to the mix. Another thing people seem to be constantly complaining about in Quarantine is the final “infected creature” wasn’t nearly as intimidating as the girl in Rec. But how they shoot that final ten minutes still has everyone’s heart pounding. Neither movie is tame when it comes to the graphic factor, but Quarantine is definitely more extreme. With the camera man mauling a zombie, and witnessing a dog in the elevator succumb to the same fate. The effects in both films are amazing, but if you’re simply looking for bloodshed Quarantine spills gallons more. First major difference: In Rec the cameraman never makes an appearance, where as in Quarantine the cameraman is seen at least partially multiple times. In both films, the relationship between the reporter (Angela) and the cameraman (Pablo/Scott) is very established. So in Quarantine the relationship isn’t soured the least bit by having Scott on screen from time to time as so many people say it does. In fact, one could say it adds more depth to their relationship. Second: The two main firefighters (Manu and Alex in Rec, Jake and Fletcher in Quarantine) are quite different between the two films. In Rec, we are meet them and liking them is a given. But we’re not supposed to feel much sympathy for them. Where as in Quarantine gives us more face time with the two at the beginning at the fire station so we feel more of a loss when they’re taken out of the picture. Third: The reporter (Angela) is somewhat likable in both films, but in Rec she has a bitchier, more career-oriented attitude. Where as in Quarantine, Angela is younger, less seasoned, and overall a nicer person. Both can characters play the lead role quite well, but Quarantine’s Angela seems to feel the impact of the situation and has a genuine fear. As shown in the scenes displaying her mental breakdown. Neither portrayal is better than the other, they are just two slightly different Angela’s. Fourth: The residents differ slightly, but does it matter? Everyone dies in the end anyways! However in Quarantine the residents do play a larger role as the group slowly gets picked off. From shot to shot, there isn’t much variation between the two films– but there are a few things one would notice on a second or third viewing. Such as added scenes and dialogue at the fire station in Quarantine to make us identify with the main group of characters further. There is also more creature set-pieces in Quarantine, to be more specific the old lady watching television scene, and the “infected” dog in the elevator scenes. One big change between the two is the origin of the infection. Which one is better is something you must decide for yourself. Personally I lean in Rec’s because it’s the original. When viewing Quarantine be on the watch for the extra scenes as really do add that extra impact when it comes to character depth and relation. Now on to the real question. Which film do you think was better, scared you more, or was more realistic? If you’ve seen both that is. Also how did you feel about Rec 2 and Quarantine 2?